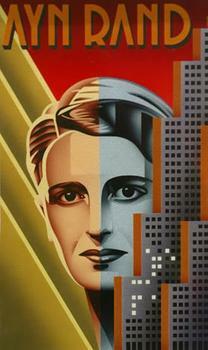 Ayn Rand’s recent appearances in the news made me think about her position on urban issues. Some of her novels suggest that she is anti-city, believing that individualism can only be achieved by living in remote areas. In Anthem, for example, her protagonist lives in a type of dorm where people are never allowed to be alone. He achieves the freedom that he couldn’t realize in this totalitarian society by escaping to an isolated home in the woods. Likewise, her description of Galt’s Gulch, the mountain utopia in Atlas Shrugged for productive capitalists, is based on Ouray, Colorado. Ouray is a beautiful town in a beautiful part of the country, but its built landscape notably shares little in common with the urban areas where her villains live. While her Galt’s Gulch description is clearly fanciful, I think it is important to note that the characters would not have been able to support themselves in a small market with the specialties they chose before dropping out of society. Galt himself is an electrical engineer, and other residents of the Gulch include a railroad manager, a metallurgist, and a famous actress. Since the Gulch does not engage in trade with the outside world, those living in the Gulch would not be trading in a market nearly large enough to be specializing in their chosen professions. In The Gated City, Ryan Avent provides an excellent description of the specialization that is only possible within large cities. Going back to the Ouray example, this small mountain town provides opportunities for a certain type of specialization, such as spa manager or ice climbing guide, but this is only because tourists visiting the area have the requisite standard of living to visit resort towns. Since the division of labor is limited by the size of the market, the division of labor within Galt’s Gulch would be extremely limited, reducing these capitalist heros to a near-subsistence standard of living. Perhaps Rand relies on these different types of developments merely as symbolism; since few people meet her standards of individualism, they must escape to sparsely-populated areas of the country to achieve independence from government. Rand herself lived in a New York apartment in Murray Hill, a far cry from Galt’s Gulch. She lived in New York for 30 years, indicating she probably wasn’t a city-hater. She expressed admiration for the New York skyline, and Howard Roark, the protagonist of The Fountainhead (which I’ve not read), is an architect. He says, “I would give the greatest sunset in the world for one sight of New York’s skyline. Particularly when one can’t see the details. Just the shapes. The shapes and the thought that made them. The sky over New York and the will of man made visible.” Clearly Rand appreciated the type of architecture and large-scale infrastructure projects made possible by urbanization at the same time her protagonists seek to drop out of cities. While it’s difficult to say what stance Rand herself took on urbanism, we do know that Frank Lloyd Wright is rumored to have been the inspiration for Howard Roark. Wright’s views on cities are very clear. He thought that living “communally” such as in apartment buildings was anti-individualist and that densely built cities were anti-democratic. A follow-up post will explore Wright’s urban theories as they relate to individual liberty. 1. Ouray, CO has a long, built up main street with multi-story buildings and no setbacks. Tourists find it enchanting; Americans thirst, as usual, for pre-sprawl development. Ouray has little sprawl and the density of development outside the main street is higher than a typical suburb. 2. A large majority of the action Rand’s novels takes place in New York City and St. Petersburg, large and famous world urban centers. Rand gushes over the architecture, culture, and origins of cities. 3. At one point in the Fountainhead, Howard Roark builds a development out of a series of cabins in the woods, each invisible from all the others and it’s a big success. I bet Rand wouldn’t have liked it, though. 4. You should read The Fountainhead; it’s Rand’s best work. Interesting topic, as Rand and Wright were early, one time heroes of mine and, as a teenage urbanist (and chauvinistic New Yorker), I was very curious at the time to find out what their feelings towards cities were. (Walt Disney was another individualistic genius who was an early hero of mine and a person whose view about cities I was curious to find out about.) As you point out, Wright’s anti-city views were pretty easy to discover — as was his dislike for New York City in particular (although he reportedly, and anachronistically, liked the Plaza Hotel). (Disney also hated cities — and had a special dislike for New York City.) At first I thought Rand was also anti-city, since she first rose to fame as a Hollywood screen writer — and, if I understand it correctly, once she became successful she chose to live in a supermodern suburban home. But, as mentioned, she eventually chose to move to New York City and lived here for 30 years. Plus, she seemed to set up New York City as the home for her salon and affiliated institutions. Here’s an interesting article on the topic from the online edition of the defunct “New York Sun” (which hoped to be a conservative alternative to the “New York Times”) about the freedom lovers, including Rand, who chose New York City as home. “Even while pursuing a career as a screenwriter for a while in Los Angeles, for Ayn Rand, New York City was the only city to be in. As her biographer, Barbara Branden, put it, the city was to the “The Fountainhead” author, “the symbol of human achievement, the living, breathing reality of the accomplishments possible to the mind of man. … it was her life’s great love.” This was despite the fact that she didn’t make much use of the city’s cultural offerings. If the link doesn’t work you can use a search engine using the following: “The Liberty of New York” by Brian Doherty, “New York Sun,” June 27, 2007. P.P.S. — Don’t know if this is “old hat” to those who are more familiar with Rand and Libertarianism, etc. but even though Rand and Libertarianism seems to be linked together in common speach, as I understand it, Rand did not see her thought as being the same as Libertarianism. I believe she once even quipped that, “Libertarians are just right wing hippies. There’s a guy who gives regular walking tours of New York focusing on places and scenes that were important to Ayn Rand and her novels. I’d be curious to take one, but never made the time…. THREE OF THE FIVE CENTRAL FIGURES . . . LIVED IN NYC — WHO WERE THE OTHER TWO? I’m curious, does anyone more familiar with libertarianism know who the other two central figures were and where they lived? I assume Milton Friedman is one. As far as I know, he mostly lived in Chicago and then the Bay Area. Oh, and Hayek, who also spent some time in Chicago. Clicking on the linked to “New York Sun” article, I noticed that there were some current editorials also listed on the website (one of which was a discussion of Paul Ryan as a “worthy” disciple of Ayn Rand.). Exploring further I noticed there there are also current articles in the “News” and “Arts” section. So I apparently misspoke when I said that the “New York Sun” is defunct. It apparently lives, to some degree, online. P.S. — Thanks Market Urbanism for the info on the other two central figures in American libertarianism. So all five seem to have been big city dwellers and, likely, big city admirers. Heh, that brings to mind the Bob the Angry Flower classic, Atlas Shrugged 2: One Hour Later (also attached as a pic in case the link ever goes stale). The concept of individualism that Rand advocated has nothing whatsoever to do with being a loner living on a deserted island. She viewed big cities, such as New York, where millions of individuals could live and work together, as great achievements. Individualism, i.e., respect for individual rights, is a pre-condition for cooperation between men, and the foundation on which great cities must be built in order to function well. That is why, at the end of Atlas Shrugged, when all individual rights have been stamped out, we see the lights of New York city go out. As for labor specialization, Rand took that into account. None of the people in Galt’s Gulch were able to survive by focusing solely on their original profession. There was the novelist turned fishwife, the oil tycoon turned farmer, etc. Today in Stupid™: A novelist’s first major hero was an architect who built skyscrapers, and her last major scene, reflecting the asymptote of despair, was the lights going out in New York. How can we possibly know her views about cities? How? Ever read about Robert Nozick’s rent controlled apartment in Cambridge? One of my favorite stories about a libertarian. she didn’t have them abandoning the city, they were leaving the mess the men in the city had made of things. they already had plans to return to rebuild once the looters and moochers had died off. Anthem’s setting is a dystopian world in which individualism has been snuffed out and consequently all remaining civilization subsists in an impoverished communal society. The protagonist manages to escape his would-be destroyers to found a new civilization based on respect for the individual’s ego (will, creative spirit). The start of such a civilization would of course be isolated since the culture of collectivism that preceded him destroyed everything of value in the world. Galt’s Gulch in Atlas Shrugged is not meant to be an ideal plan for society. Rand’s character’s stated that such a drastic measure as withdrawing from society was only temporary. They had every intention of returning to the world and rebuilding. Galt’s Gulch is not a city or even a town it is a privately owned piece of land that is able to sustain a collection of people who choose to voluntarily associate together. Not everyone who withdrew ended up in the Gulch. Some characters became nomadic others stayed in their own homes. Taken as a whole Rand’s writings are a celebration of the city and man’s creative capacity to build.